How fondly I remember. . .
like little cubs. So, here’s a gentle wave good-bye to Else Holmelund Minarik, who wrote the Little Bear series, so perfectly illustrated by her collaborator, the recently deceased Maurice Sendak. Today’s Times says in an obituary that she died at home in Sunset Beach, NC, at the age of 91. Sounds like her. 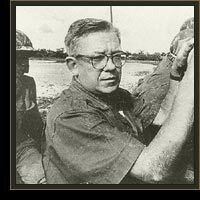 A journalistic footnote: This gentle soul was married for a while to Homer Bigart, one of the toughest war correspondents ever. A real reporter’s reporter and a two-time Pulitzer Prize winner, Bigart covered WWII, the Korean War, and the American war in Vietnam. Bigart, who was her second husband, died in 1991.